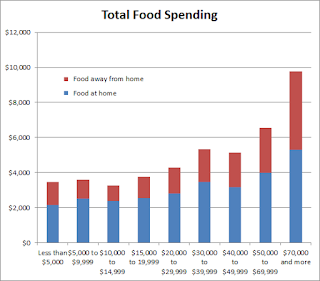 The BLS CEX has data on average spending in food categories covering grocery spending and spending on eating out. They have tables that break the data down by income groups. The data here is from 2011. I also thought it would be interesting to see what percent of the grocery budget for food eaten at home goes to different types of foods. For example : Do poor people eat more carbos and less veggies as a portion of their entire grocery budget? Or do rich people spend more of their budget on steaks and fancy cheeses? 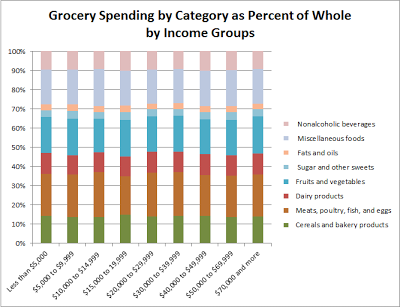 I found it interesting that there is fairly little variation in the percent of the grocery budget that goes to each category across income groups. The differences in % of total budget spent across income groups varies only 1-3%. For example every income group spends 9-10% of their grocery dollars on nonalcoholic beverages. Now of course we can see from the first chart that peoples spending on groceries goes up with income. However the portions spent in each aisle of the grocery store seems to stay fairly consistent no matter how much you make. 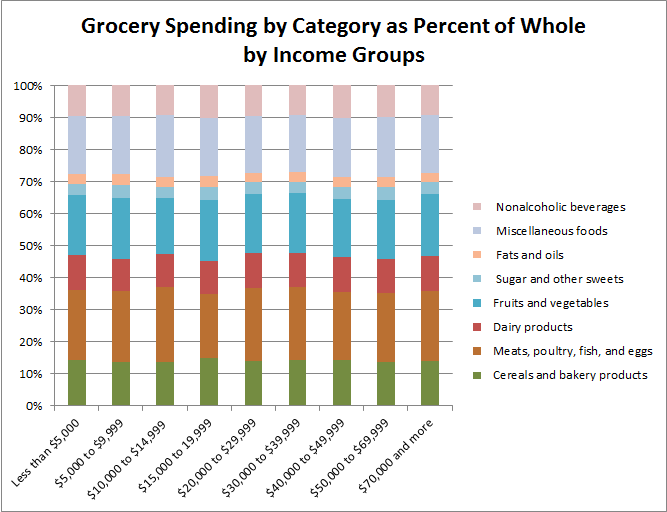 So poor people and rich people spend about 10% of their grocery money in the beverage aisle, 22% in the meat section, 11% on dairy, etc. The IRS has data for which returns claimed rental income or losses. I got the info from the IRS taxstats pages and specifically here the 2009 figures in MS Excel . This gives us an easy way to see how many landlords there are, how many of them made money and what their adjusted gross incomes were. Let get some details out of the way, first this is just for the year 2009 and situations change somewhat year to year. Second this is just from the individual income tax returns so its based on tax figures and individuals so it doesn't capture corporations who own apartment complexes or similar businesses that wouldn't file individual income taxes. We had about 9.8 million individual landlords in the nation which I conclude from just over 9.8 million tax filers showing rental income gains or losses. Around 7% of people are landlords. There were around 140 million tax filers and 9.8 million claiming rental income so that equates to about 7%. A majority of landlords lost money (on paper at least). 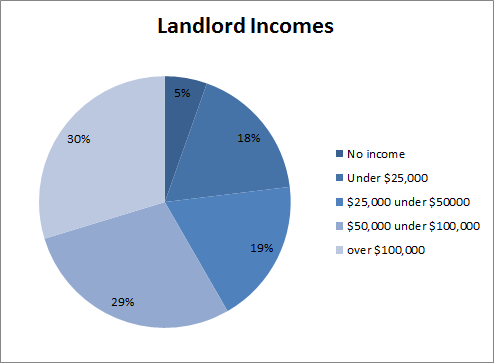 5.72 million or 58% of the landlords showed loses from their rentals on their tax forms. 4.15 million landlords, 42%, had gains from their rentals. Most landlords aren't in high income brackets. Median gross income for landlords is between $50,000 to $75,000. 70% of landlords had income under $100,000 and 42% of landlords had under $50,000 in AGI. Now lets look at some charts. 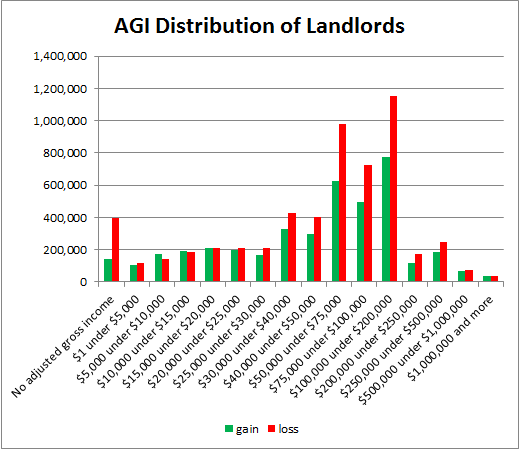 That one shows the total number of landlords in each AGI bracket. 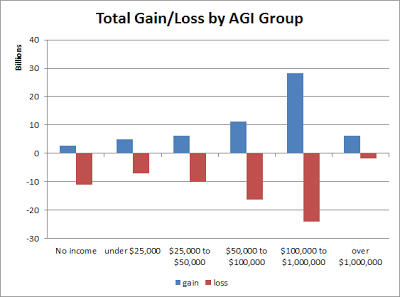 Note : I wouldn't make too much about the gains versus losses here as this is only the taxable numbers. We're talking about Adjusted Gross Income (AGI) and gains or losses claimed on your taxes so this is not the same as cash flow and it includes 'paper losses' such as depreciation. In other words a landlord may show a loss on their tax forms due to depreciation and other deductions but actually come out ahead. Thats not uncommon given the large depreciation deduction. Also the rental loses may push a landlords total income into the loss category which is seen with a large spike of landlords who have rental losses and no taxable income. This is a pretty short post but I wanted to capture this fact. A while ago I was trying in vain to find some data about what percentage of people are paid hourly and how many are paid salary. I stumbled into the number on a BLS site. "In 2011, 73.9 million American workers age 16 and over were paid at hourly rates, representing 59.1 percent of all wage and salary workers." There you go, 59.1% of people are paid hourly wages. That means therefore that 40.9% are paid salary. They exclude people who are self employed. You may have heard someone say that "new cars lose half their value when you drive them off the lot" or something similar. 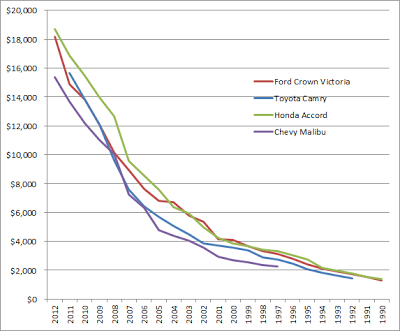 While its true that cars depreciate a hefty amount in their first year its not that steep of a drop that fast. After the car is used it tends to depreciate at a more gradual pace year over year. I chose those models semi-randomly. I needed to pick some cars that had been on the road over many years. I also wanted some cars from various manufacturers. 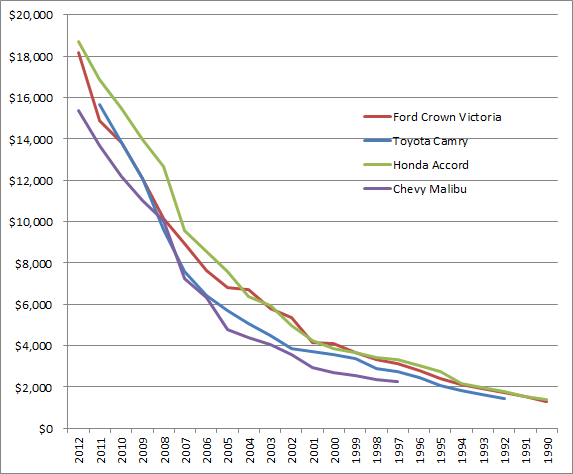 First lets look at the actual dollar value for a few typical used sedans based on model year. As you can see there the pattern of depreciation is pretty similar. 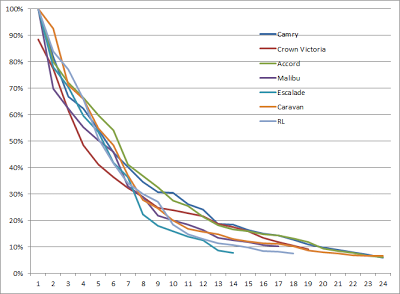 Now lets normalize and look at % values from the start over a number of year. The chart below looks at prices starting in either 2011 or 2012 and then shows the % of value retained each year after that. So for example the cars are generally down to 50% of the original value by the 5-7 year period and then down to only 20% by 8-13 years. 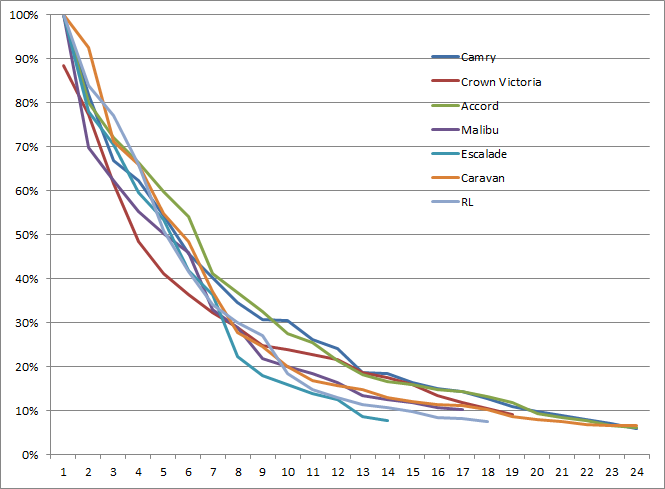 This is a pretty small sample of cars so I'm not going to try and take much meaning out of this as far as differences between models. The idea here is just to look at depreciation for cars in general. Note: This is a crude approximation of depreciation trends. For one I'm ignoring inflation and not figuring the initial retail cost of the older cars when new versus their current resale value. "HERE is a test. Suppose you had $100 in a savings account that paid an interest rate of 2% a year. If you leave the money in the account, how much would you have accumulated after five years: more than $102, exactly $102, or less than $102? This test might seem a little simple for readers of The Economist. But a survey found that only half of Americans aged over 50 gave the correct answer. If so many people are mathematically challenged, it is hardly surprising that they struggle to deal with the small print of mortgage and insurance contracts." Wow. This is shocking to me. Can the results be accurate? Are people really that bad at math or ignorant of basic finances? The BLS has the Consumer Expenditure Survey. One of the tables breaks down the numbers based on the number of people in the household. 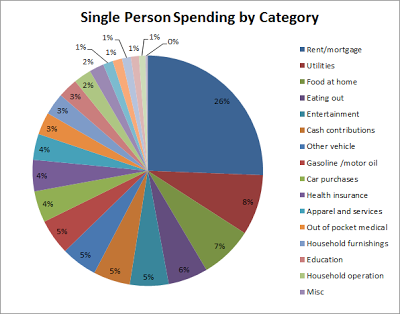 This gives us an easy way to find the spending for single people. This is the 2011 data. Now I've renamed some of the categories from the CEX report and I've rearranged a couple of them. I did that just to present it in what I think are simpler budget categories. There are a few things to keep in mind with these numbers. They are averages across the entire population and not everyone spends money on all of these. So for example most people don't spend $255 a year on tobacco but the 20% or so of people who do buy tobacco probably spend $1275 a year and averaged out that comes to $255. The BLS tracks the cost of employment for employers. The Employer Cost for Employee Compensation is part of the Employment Cost Trends data. 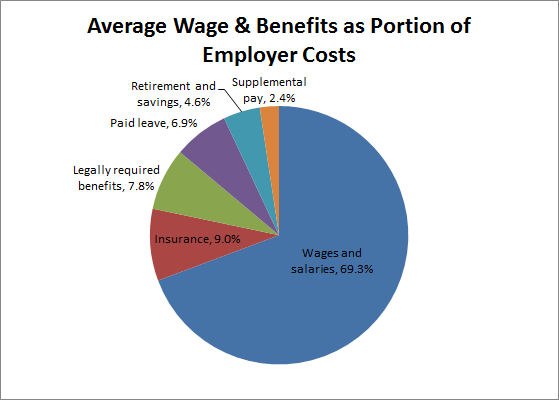 The major benefit non-wage benefit costs are in gray and the sub-costs for each of those are listed below them. Not everyone has all these costs of course but these are just nation wide averages. For example they list both defined benefit and defined contribution retirement costs and most people have one or the other but not both. You can tell this comes from a government ran website cause everyone else would say 'taxes' instead of 'legally required benefits'. From the employee perspective I would look at 'paid leave' as part of wages. My paycheck is for my salary which combines days I work and days I don't work. Of course getting my vacation time and holidays paid is a benefit of my job so you can consider it a benefit cost too. Again, this will vary considerably from job to job and employer to employer. A highly compensated executive will have a lower percent of their compensation in health insurance and taxes and a low paid retail clerk may see zero compensation in many of the benefit categories. If you haven't had your health insurance premiums increase a lot then then you're in a minority. However the increase in the bill you pay may not have much to do with the increase in the health insurance cost. Its actually quite common and easy for your own health insurance premiums to go up at a very fast rate while the cost of your insurance has only grown marginally. The reason for this is that employees normally only pay a small fraction of the actual premium costs. Then when the premium increases the employer may shift the bulk of that price increase to the employees. Lets say your health insurance ran you $133 a month in 2012 and now in 2013 they jacked it up to $147 a month. Thats a 10% increase. Your costs went up 10%. However your employer actually pays 80% of the premium. In 2012 the actual total premium was $8,000 and your employer paid $6,400. Then in 2013 when the rates went up 2% to $8,160 they decided to make you pay the entire increase and passed the extra $160 on to you. In 2013 the employer pays $6,400 and you pay $1,760. Now that example is a bit extreme and most employers don't dump the entire increase on the employees in a given year. So this isn't really what I'd call typical but it certainly can and does happen. As the cost of health insurance has gone up over the years the employers have pushed more of the increased premiums over to the employees. This results in high percentage increases for the employee premiums. Most employees see this as a 10% increase and then assume that means that the cost of health insurance rose 10% while it doesn't mean that at all. Over the past decade or two on the average the workers cost has gone up a bit faster than the employer share. Between 2007 and 2012 the worker premium for family coverage at large firms went from $2,831 to $3,926 Thats a total increase of 39% and annual growth of 6.75%. However the cumulative increase in premiums from 2007 to 2012 was up only 30%. or just annual growth of 5.4%. As you can see in this chart the total increase in premiums from 1999 to 2012 was up 172% while the workers premium grew by 180%. Thats not a huge difference but if you look at that chart you can see that the total premium and worker share grew mostly at the same rate till about 2009. Then from 2009 to 2012 the worker share grew a lot faster and in fact 2009 shows a large leap in the worker share. This isn't exactly earth shaking revelation to many as I assume many people are well aware that their employers are shifting more of the costs or at least the increases to the workers. However I think a lot of people simply don't know or just don't think about how their portion of health insurance costs are usually small compared to what the employers pay. Plus it does take a little basic algebra level math to see how your increase in cost for your smaller fraction isn't the same as the increase in costs for the entire amount. 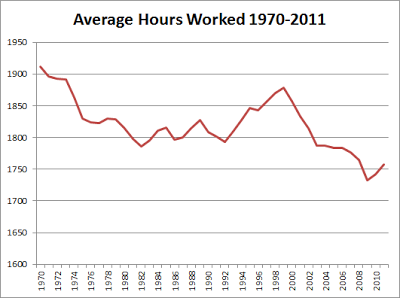 Below is a graph showing the average number of hours worked annually per employed person. I got the data from the Federal Reserve bank of St. Louis' FRED system. I presume this is a combination of people who work full time and part time and a reflection of the total hours that full time hourly and salary people work. Hard to say if this means more part time jobs or fewer long hours by full time workers. 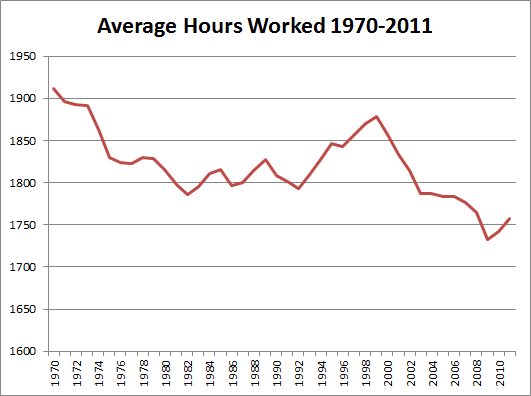 But in any case as a nation the average person is working fewer hours. For quite a while LED bulbs have been too expensive to warrant the purchase and not really cost effective over CFLs. When I looked at LED light bulbs last spring I concluded that LED bulbs were still too expensive. At that point the LED bulb I looked at was 'under $19' But today that same bulb is $16.09. As I assumed in that article over time prices for LED bulbs are coming down. There are also LED bulbs cheaper than that in the $11 range depending on size and application. With LED prices coming down I decided to take another look and see how they compare to CFLs (compact fluorescent lamps). I'll look at three different applications. To compare the costs I'll first just add up the cost of the bulbs and the cost of electricity assuming 10¢ per kWh. I'll also then do a NPV (net present value) comparison. I will ignore inflation so this isn't a perfect analysis but good enough to get a basic idea of the numbers. To make the math a little easier lets assume 7500 life on the CFL and assume you need 4 of them to last as long as the LED. Now I also did a NPV calculation assuming 4% discount rate and came out with NPV of $26.89 for the LED and $35.35 for the CFLs. This is because you're spending more of the money today with the LED so its not quite as favorable when you look at present versus future costs of money. But I did a simple figure and didn't account for inflation of electricity or bulb costs so its not perfect. For this example the LED is cheaper in total cost. NPV would be $15.68 for the LED and $16.31 for the CFLs. LED still wins. NPV numbers are $52.54 for the CFL and $35.48 for the LED. Note these bulbs are not exactly the same in shape and size. However the LED specs. claim its a replacement for recessed lighting and R20 size bulbs. It will be a little smaller than the CFL version, but I couldn't find a direct equivalent CFL to LED for this application. In both cases the LED's are cheaper over the life of the bulbs. In all three cases I looked at here the LED comes out on top. However if you change any details then the CFLs could easily be cheaper, it still depends on the specifics. It seems if you are willing to take the leap to LEDs then it is worth it financially. I think I'll still wait on buying LEDs until they're a little more proven. They claim long lifetimes and I expect thats realistic given LED technology but I think I'd like to wait and make sure the technology is proven. Plus if I wait a little longer I expect LED prices will drop even further. Did you read that title correctly? Yes you did. I said that firefighter is NOT a dangerous job. Bear with me folks as I know this is contrary to what we all know. You see the rate of fatalities on the job in various professions is measured every year. We can get the 2011 data from the BLS. Turns out that lately firefighters have a work related fatality rate at 2.5 per 100,000 that is lower than the national average of 3.5. That means that firefighters are less likely to die at work than average. Firefighting is safer than the average job. In fact if you look at that list you'll see that janitors have a fatality rate of 2.4. In effect, firefighting is only marginally less safe than being a janitor. Now if you're thinking to yourself "oh that can't be right, everyone knows firefighting is dangerous" then heres a few things to keep in mind. First its my understanding that at least locally firefighters are now taught to NOT go into burning buildings. This is contrary from the past or at least what we see on TV where they may have entered burning buildings for whatever reason. Second the modern building codes make for safer buildings in general and less fires as a result. Combine these two things and you get fewer fires and firefighters taking fewer risks. Lastly I would also assume that modern technology has helped protect firefighters from the dangers on the job. If you or someone you know is a firefighter then you may be thinking of how dangerous the job actually is and know of people who have died on the job. I have no doubt that firefighting is dangerous and that firefighters tragically do die on the job. I'm not doubting that. But in terms of total fatalities on the job and the rate of such fatalities the statistics prove that is is not as dangerous as many other professions. There are a lot of reasons people die on the job and most of them are nothing that would fetch any newspaper headlines. Mundane things like auto accidents and falling off ladders are among the highest cause of job related fatalities. Taxi drivers are a lot more likely to die on the job than most primarily due to traffic accidents and construction workers are over 5 times more likely to have fatalities as firefighters. I think it should make everyone happy to know the occupation of firefighter isn't as dangerous as it was in the past. I generally like the idea of investing in stocks that pay good dividends. This has been a strategy of mine with my Roth IRA investments. I was using a High dividend stock strategy in 2008 but at that time as I said it wasn't hard to find blue chip stocks paying 4-7% yields and ETFs yielding 4-9%. That was a reflection of the stock market being full of bargains at the time. Nowadays yields from dividends aren't as high and stocks aren't as cheap in general. When you've been writing a blog for nearly five years like I have you sometimes end up repeating yourself. I first wrote about this topic in 2009 with the article Are There Safe Dividends? and I pointed out then that dividends really are not 'safe'. I found out myself after GE slashed their dividend not long after I had bought them. I later questioned Why Do I Own GE Stock? Of course it wasn't just GE that cut their dividend. A lot of major companies cut dividends during the financial crash around the Great Recession. Lets look back at the Dow components from 2008. Now not all those stocks are still on the Dow as the Dow changes gradually over the years as some stocks are removed and others added. Thats just over 25% of the Dow components from 2008. And these are the big name blue chip companies that are generally safer and more established. Now this is not to say that investing in dividend paying companies isn't a good strategy. But you shouldn't put too much faith in the future payout rates on those dividends. I see people building dividend paying portfolios with the intention of building a passive income. If you'd done that in 2007 and bought up Dow stocks then retired early with the intention of living off the dividends then you might have been in for a nasty ~25% cut in income come around 2009.